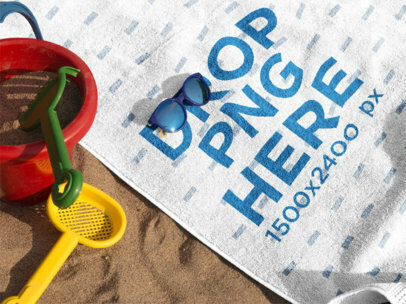 Check out this awesome mockup of a beach towel lying on the sand with sandals and accessories on it, it's a really cool image that you can use to start selling more. 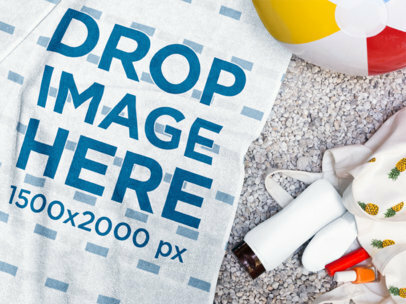 Drag-and-drop your image file on the interface, we will merge it with the towel for you in just seconds. Try another Towel Mockup here! Check out this awesome mockup of an iPhone, a can and orange headphones lying on a towel, it's a really cool image that will help you build a much stronger image marketing. Drag n' drop an image file of your preference on the interface and see how it gets merged with the towel. Amazing, right? Try another Towel Mockup here! Have a look at this beautiful template by Placeit! 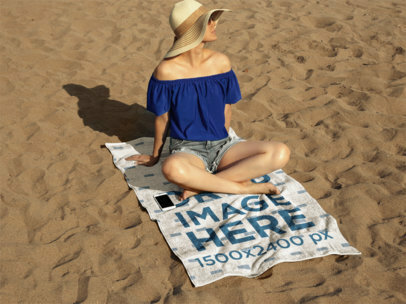 It has a girl sunbathing while lying on a beach towel template at the beach, it's a beautiful image that will help you build a better image marketing. All you have to do is drag-and-drop an image file on the interface, we will merge it for you in just seconds. Try another Towel Mockup here! 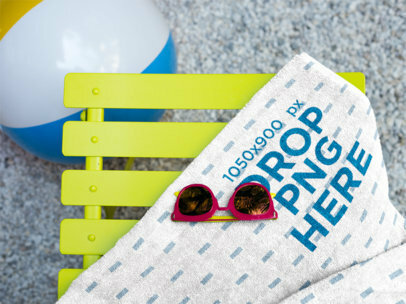 Have a look at this awesome mockup of a towel lying on the beach with sunglasses above it and accessories nearby, you can change its color! All you have to do is drag n' drop an image file on the interface, we will merge it for you in just seconds. Start now and make your revenue grow with Placeit's visual assets! Try another Towel Mockup here! 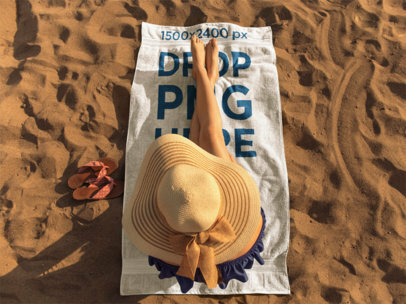 Check out this gorgeous mockup of a young lady sitting down on a towel while at the beach, she's wearing sunglasses, a big hat, denim shorts and an off-the-shoulder top. She also has a white iPhone lying beside her, drag-and-drop your image file on the interface, it'll be processed in just seconds. Try another Towel Mockup here! Have a look at this beautiful girl's legs while she's sitting down in a towel at the beach, she has pink sandals and accessories nearby. Drag-and-drop your image file on the interface, we will process it for you in just seconds. What are you waiting for? Make more money now with Placeit! Try another Towel Mockup here! Have a look at this gorgeous image of a pretty girl wearing a towel on her back while inside a beach location, she's near a palm tree wearing jeans and a tank top. Drag-and-drop a jpeg or png file on the interface, it'll be merged in just seconds with her towel. Use Placeit's visual assets and make your revenue grow! Try another Towel Mockup here! 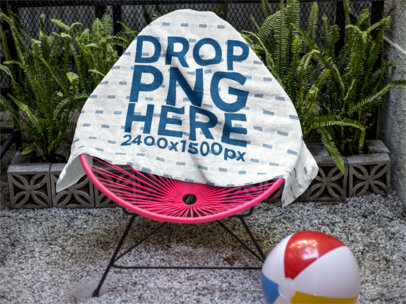 Check out this awesome template of a beach towel on a pink acapulco chair near some plants and a beach ball, it's a really cool template that you can start using to showcase your designs! Drag-and-drop your image file on the interface, it'll be merged with the towel in just seconds. Try another Towel Mockup here! 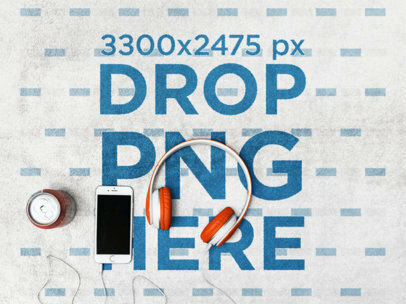 Have a glance at this beautiful image mockup by Placeit. It features sunglasses on a towel, lying on a lime green small beach chair while a beach ball is near them. Isn't it a beautiful image? 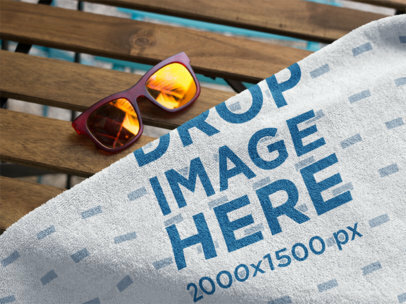 Use it to showcase your latest towel design to your audience and leave them amazed! Just drag-and-drop an image file on the interface, we will do the processing work for you in just seconds. Try another Towel Mockup here! 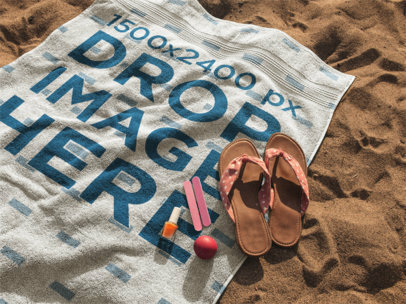 Check out this awesome template of a beach towel with sunglasses and pink accessories on it, it's a great visual asset that will help you build a better image marketing. Start now and make your income grow! All you have to do is drag-and-drop an image file on the interface, we will merge it for you in just seconds. Try another Towel Mockup here! 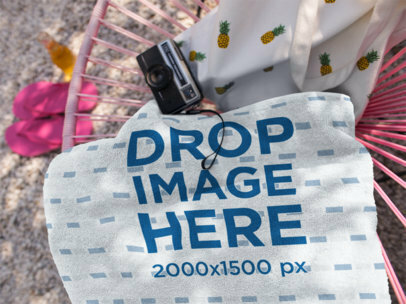 Have a look at this beautiful mockup of a towel lying on the floor with a beach ball and beach accessories beside it, it's a really beautiful image that will help you enhance your summer designs! Drag-and-drop your image file on the interface, we will merge it for you in just seconds. Use Placeit and make your revenue grow! Try another Towel Mockup here! 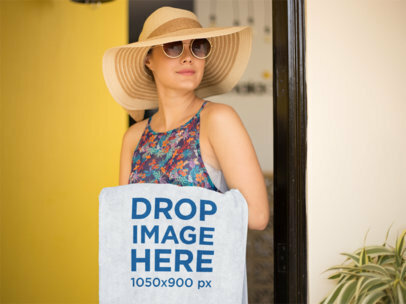 Have a look at this awesome mockup of a young woman holding a towel while walking to the beach, she's wearing a hat, sunglasses and a tank top. 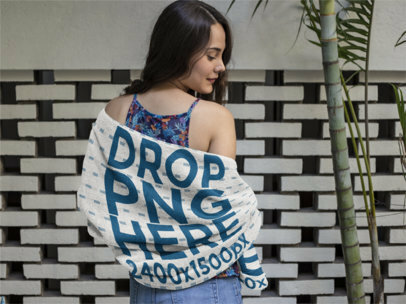 Drag n' drop an image file over her to merge it with her towel, it'll just take a couple of seconds. Amazing, right? Try another Towel Mockup here! Check out this towel lying on a pink acapulco chair, it's a really gorgeous image that will make your designs stand out. Drag-and-drop an image file on the interface, we will merge it for you in just seconds. Use Placeit 's assets and make more money! Try another Towel Mockup here! 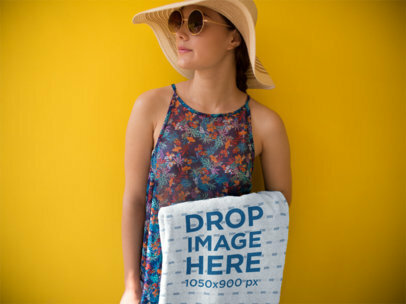 Promote your designs with this awesome template of a young girl holding a towel while against a yellow background, it's a really cool visual asset that will help your make more sales! 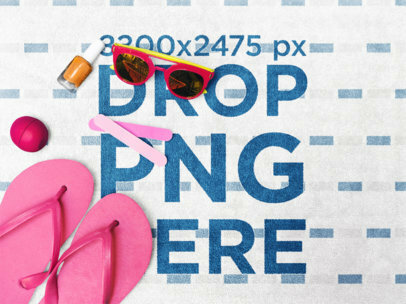 Drag n' drop an image on the interface, we'll merge it for you in just seconds. Try another Apparel Mockup here! 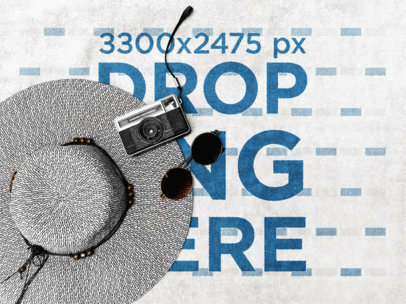 Check out this awesome mockup of a hat on a towel with sunglasses and a camera on it as well, use it to make your income grow in just days! All you have to do is drag-and-drop an image file on the interface, we will merge it for you in just seconds. Use Placeit and make your income grow. Try another Towel Mockup here! 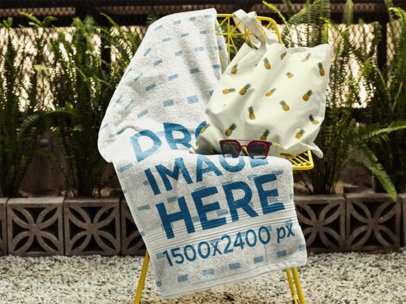 Have a look at this beautiful mockup of a towel extended on an acapulco chair with a pineapple printed bag and sunglasses on top of the towel, it's a really cool image that you'll be able to use to strengthen your image marketing. Start using Placeit and see how your revenue grows! All you have to do is drag n' drop an image file on the interface, we will merge it for you in just seconds. Try another Towel Mockup here! 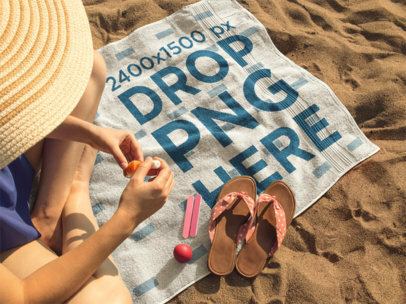 Check out this awesome mockup of a woman sitting on a beach towel with her sandals and accessories nearby, it's a really cool visual asset that you can start using to promote your brand to a higher level. All you have to do is drag n' drop an image file on the interface, we will process it for you in just seconds. Make more money using Placeit! Try another Towel Mockup here!